Turkeys are the quintessential American poultry. 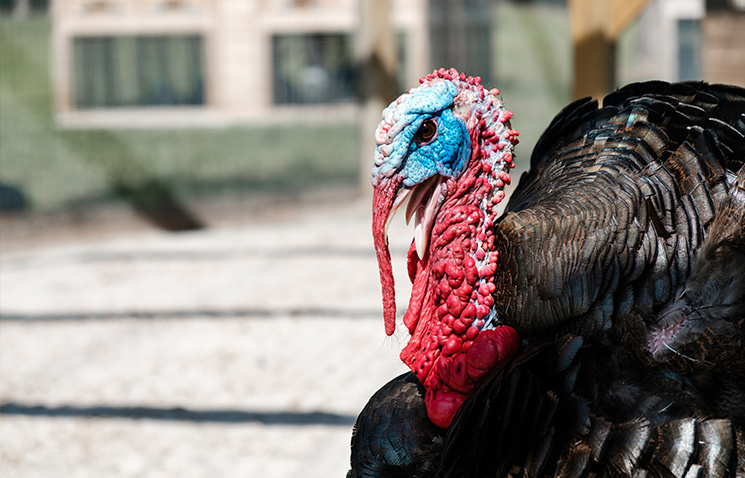 They are one of the very first poultry species raised by Americans and all domesticated turkeys are descended from wild turkeys indigenous to North and South America. The American Poultry Association recognizes 8 varieties of turkeys in its Standard of Perfection. The Heritage Bronze Turkey is one of them. Their temperament is highly dependent on the breeder. Our breeding program selects for the most docile and the Heritage Bronze turkey poults are always popular with our children. Heritage Bronze are the largest American turkeys and have been one of the most popular. Standard size for a female bronze is 16 pounds and Toms are 25 lbs. Hens lay beautiful large large cream spotted eggs. What is a heritage turkey? A heritage turkey is one which retains historic characteristics that are no longer present in the majority of turkeys raised for consumption since the mid-20th century. Naturally mating, unlike commercial turkeys which require artificial insemination. Hardy with a life span of 3-5 years from breeding Toms and 3-7 years for breeding hens. Slow to moderate rate of growth (28 weeks). Thomas is our Tom. Get it? Okay, we weren’t too original with his name. We also never intended to raise turkeys but we fell in love with his father’s incredibly affectionate personality while visiting our favorite chicken breeder in Apopka. So before we knew it we came home with 3 poults and now we cannot imagine not raising Heritage Bronze turkeys.